Should You Put Your Wipers Up or Down Before a Snowstorm? Yes, there actually is a right answer to this conundrum. Walk down your street just before a winter storm looms closer and closer, and you'll find at least one weirdo with his car's windshield wipers standing perpendicular to the front window. Is he the bastion of all wisdom because he knows something the rest of us don't or is he just wasting his energy? 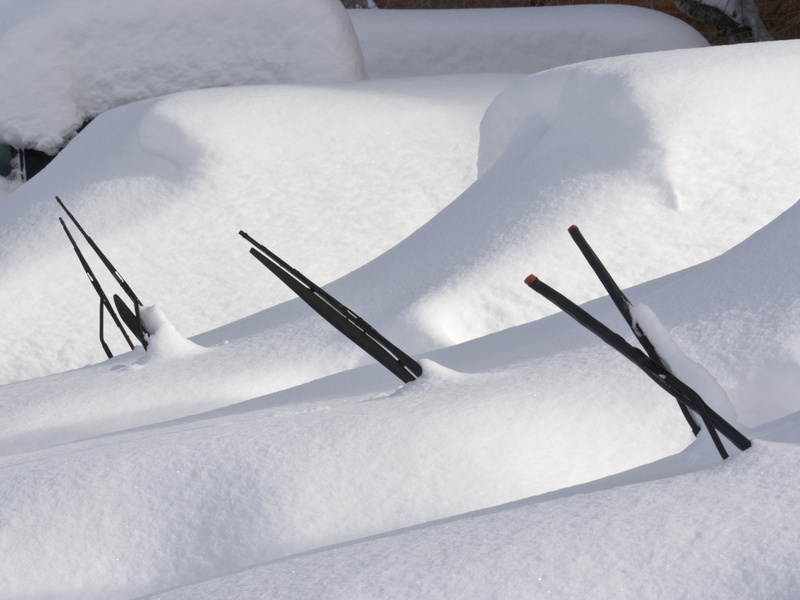 With a near-spring blizzard making its way across the country today, it's high-time we re-addressed the wipers up/down controversy that keeps folks awake at night wondering what to do. We've talked about it before, but we aim to give this issue more teeth now. Though no laboratory tests have ever been conducted to support either side of the argument, it doesn't mean that the issue can't be resolved here and now. The debate has been going on for ages, and it seems the answer has never really been definitive. Here we are to settle the matter once and for all, or at least we hope to. Wipers in the up position make cleaning them and your windshield easier. There's less of a chance that you'll damage the rubber because you don't have to pry them off the glass. This technique prevents damage to the wiper motor in case you left the wiper stalk in the "on" position when you turned the car off. Once you start the car again, the wipers will move freely since they're not stuck to the glass. Wipers in the up position still have to be cleaned, especially if ice has formed on them. They may actually be more difficult to clean off since ice and snow can form around the entire blade. High winds can damage the wiper arms, and if a tree branch or something large lands on the wiper arm, it can cause irreparable damage. If the wind is strong enough, it can cause the wiper arms to snap back and may even crack the windshield if it's cold enough and the wiper arm hits hard enough. Even wet, heavy snow can cause damage to the arms. Wipers in the up position might invite vandalism, presenting an easy opportunity for someone to bend your wiper arms backward or steal those expensive beam-style wiper blades that cost upwards of $25 a pop. If you take a look at your street, you'll notice that most people don't actually bother to put their wipers up before a forecasted snowfall. Whether because they're lazy, don't care or simply forget is unknown, but the vast majority of folks don't seem to think it's a big enough issue to worry about. There are bigger priorities like digging out your car and making sure you have sub-zero windshield washer fluid in your car's reservoir. That being said, there are advantages to keeping your wipers in the down position. If you warm up your car sufficiently and allow the heat to kick in, the ice will melt and unfreeze your wipers without your having to clean off the ice. This minimizes overall work. Starting the car and running the defroster is also good for the engine's life so it can get up to operating temperature before you send it to higher RPMs by driving it. You only risk damage to rubber wiper blade if you prematurely pull the blades off after moisture has formed and then frozen around the area where the blade makes contact with the glass. You're unlikely to damage the wiper arm itself, which could happen if you leave your wipers up, a more expensive replacement. As we mentioned before, it seems that most folks keep their wipers down, but that doesn't mean there aren't disadvantages, as well. It's entirely likely that those who habitually put their wipers up have done so in response to bad experiences after doing the opposite. Here are some downsides to keeping them in contact with your car's windshield. If the snowfall is significant, it makes it harder for you to use your snow brush to clean off the lower portion of the glass. If you don't warm up the car and allow the ice to melt, you can damage the wiper blades, and scraping the ice off beforehand is cumbersome. As mentioned before, you can damage the wiper motors if the blades are frozen to the glass and you left your wipers on before you shut off your car's engine. We've offered up all the pros and cons to both sides of the argument, but at the end of the day, there should be a conclusion to it all. What is the best way to handle your windshield wipers when the big snow hits? Our strong recommendation would be to keep your wipers in the down position and make sure to warm up your car before cleaning your windshield to allow the ice to melt. This minimizes damage risk, reduces the amount of overall work, and also allows your car to warm up before you head out on the treacherous roads. Keeping them in the up position doesn't necessarily reduce the amount of work you need to perform to get your vehicle ready to drive, and the potential damage to your wipers and windshield is significantly higher. Question asked and answered. Now, just plan and act accordingly, drive safely and keep your head on a swivel. Of course, you can just bypass all of this debate by getting a super-convenient car cover for snow that will keep it all off your windshield.